Nothing about life is as true as this: everything changes. In a moment, in a month, or in a life time. It changes. I have been reminded of that a lot lately. From me jobs, car accidents, new cars, and more, I’ve had a lot of changes in my life. And just turn on the news to see the hurricane, or the latest protest, and realize that change is happening all around us. I think the harder thing to do is change myself. Even when I need to. Even when I want to. Realizing I need to excersize as I get older is easier than actually getting up and moving. Realizing I need to eat better is easier than putting down the candy bar. And knowing I need to write is so much easier than actually doing it. Back in April of 2015 I got a fantastic idea for a story by looking at a lonely piece of art. The art was looking for a book to be a cover for, and it would be a fantastic cover. Unfortunately it was a pro artist and I can’t afford his rates. But that didn’t stop me from writing the story. So in. May of 2016, a year later, I started outlining the series. Five books. Five complete stories, each one with a valuable part to play in making one girl, Sybel, who she needs to be to save everyone from an unknown danger. I started writing it during NaNoWriMo 2016. And tonight I’ve completed the first novel in that series! It feels so good to be done. I wrote the first draft, went through line by line to clean up any plot holes and add descriptions to some areas, and I’m finally satisfied that it’s ready to go to the editor. So happy! And I can’t wait to share it with all of you. 5min – The goal is right there! It’s 3:30 in the morning and I just finished editing a few more chapters of Dragons’s Flame. That leaves one more chapter, and the epilogue, to finish. Once I’m done I can send it off to the editor. I almost finished it tonight, almost, but when I started editing the final chapter my brain started rebelling. Writing is so much different than editing. For writing it’s often helpful to be slightly tired because then it’s easier to let go of that editor trying to fix things all the time, and just write. Sometimes I write my best words while slightly tired at the end of the night. Other times I write the worst. I think it depends on how sleepy I am. Just slightly sleepy with a cup of coffee, great. Ready to fall over on the keyboard? Not so much. I’m so happy with how the novel has come out. It is currently 49,500 words long. After editing this last chapter I’m pretty sure it will be 50k. That’s perfect. I wasn’t trying to hit that number, but it is a nice number in instead. And the second book is already 40k words long and only about half finished so it will likely be longer. That’s about how the Witch’s Trilogy worked out as well. Last month, and this month so far, has been the best writing months I’ve had all year. I think this five minute writing page has helped a lot. It’s gotten me to get out of my head, and get onto the paper. It’s also been very good at getting me to write instead of just thinking about writing. ​Goals for the rest of July- Finish the second draft of Dragon’s Flame and get it to my editor. And do a synopsis/plot for book three in the series. Goals for August- Finish the first draft of Dragons book 2 (no name yet) and start on book three. So much writing, so little time, at least that’s how it feels. The other thing I need to do is look more into tiny houses. That’s right, tiny houses. My boyfriend and I would like to do both of our businesses full time instead of me working for someone else and having only an hour or two a day for writing. He has a nice income from his leather working already with commissions and donations/subs on twitch. Now it’s time for me to get to a point where I don’t need to have another job. The best way to do that is lower our monthly expenses. At $1300 a month, plus all the utilities and everything, I’m pretty sure our apartment takes up the most time and money. Cleaning, and cleaning some more, and trying to throw away half our things. Ya, it’s time consuming. But, if we get rid of all but what we really need (or love) and move into a small trailer or tiny home then we can pay less than a grand for everything. And if we make our tiny home then we can configure it to suit our needs, instead of someone else making it for us. God I hate carpet. There will be no carpet in my next home, or any other from now on! Cabinets, little drawers, and a couple of big closets for clothes, and there we are. Not much to it. And that’s my five minutes. I just got home from the chiropractor and am realizing…I don’t really want to go anymore. I mean, I do, just not like this. I’ve been going every week since the car accident. And this has resulted in a massive drop in pain, more movement in my arm, and less problems with my wrists while typing. I also have fewer headaches. All of these problems were caused, or in some cases maybe made a lot worse by, the car accident. Wrists were jammed into the steering wheel, shoulder into seat belt, neck stretched when coming to a sudden stop…it’s not good for your body to get slammed to a sudden stop like that. Regardless, I’ve been going for a long time, and I’m just burned out. Even if it is helping, and I still have a shoulder that acts up now and then, I am burned out. So I started thinking about burn out. Chris Fox actually did a video on this the other day. He did it about making your back list work for your, but he talked about it because he was burned out on writing (go figure after writing a book in less than a week several times.) But he didn’t really talk about the burn out as much as using the back list. I was burned out after finishing the trilogy. I use to write short stories, and novellas, then I did an entire trilogy in just over a year. I guess my fortitude wasn’t as great as i thought it was. Because after completing that trilogy I started on my new series, The Half Blood Sorceress, and completed a good chunk of book one and two before hitting a wall. Still writing it, still pushing forward, but I am not able to keep up the same pace that I did the year I wrote the Witch’s Trilogy. But more later, my five minutes are up. 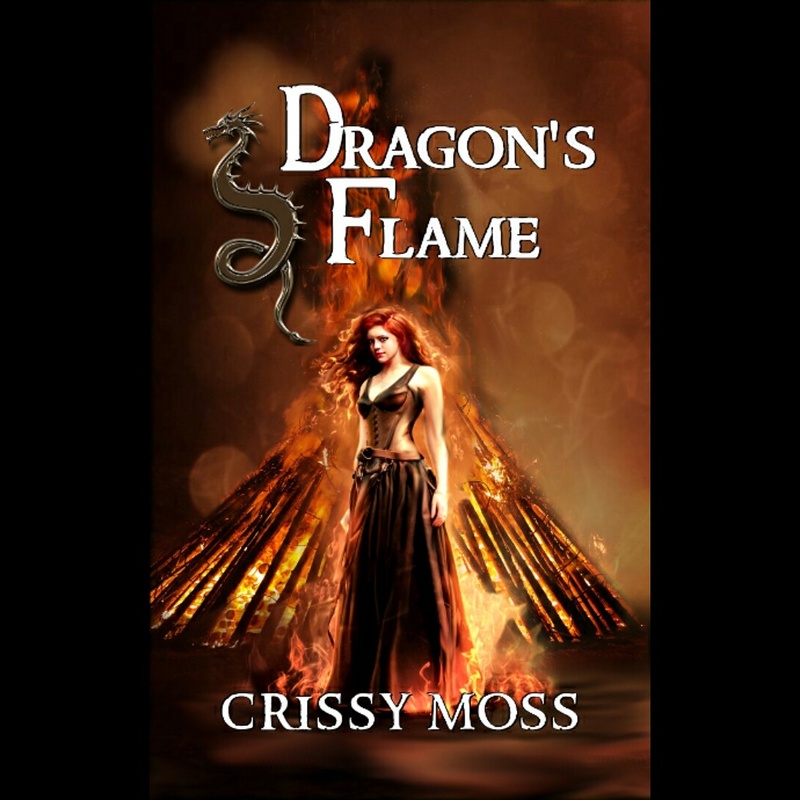 The first chapter of Dragon’s Flame, book 1 in the half blood sorceress series. Winter descended from the mountains, a cloak of ice wrapped about his shoulders. A living force of nature, his very presences consumed all before him. A blanket of snow and ice spread out at his feet, the earth crunching beneath his foot falls. A shroud of mist hung with baited breath behind him, waiting for his invitation to slip down into the valley and consume all before it. Even the sun, once bright and warm in its track, cast a cold glow upon the frozen landscape. Brittle ice caked outstretched tree limbs, weighing them down and snapping off the fragile ends. Dark rich earth and pale green grass gave way to a blanket of cold crystals as he passed. Silence enshrouded the unnatural winter as birds fell from the sky, and rodents scrambled into dens, never to emerge, their blood frozen. No being could come near to the vision of ice. For miles nothing ventured beyond the grip of winter. No sound. No animal. And no man. Nothing save the wind, and footfalls of the one carrying ice in his very soul. Word spread of winter’s passage, and villages fled south in terror. But few men lived in the north near the mountains, and fewer in the path of winter’s fury. The great leaders of the cities to the south did not see the danger creeping steadily closer to them. They could not feel the cold of winter, or hear the fury of the winds descending from the mountain. To the south where men slept peacefully in their beds, ignorant of the danger approaching. Soft light fell in a dappled pattern across my mother’s bed, like lace made from sunbeams. I hung the lace curtains for her just two summers ago when the sunlight had become too much for her weakening body. I sat on the edge of her bed, taking her hand in mine. So thin. It was like clutching a skeleton with thin paper wrapped over her birdlike bones. This was my mother, or what was left of her. Only thirty-eight and she was succumbing to a wasting disease that no cleric could seem to heal. Not that there had been many clerics visiting our small village. “It won’t be much longer,” she said. I had to lean forward to hear her words, like crushed leaves on the breeze, cracking and popping as she spoke. I smiled, I couldn’t help it, even at this stage. Mother always had an odd sense of humor. Ruling the world? From the back of a plow horse? A farmer’s wife didn’t rule much more than her kitchen. I might not have been a wife yet, but I knew it would come soon, and all the stories of mages and dragons mother shared with me would be replaced with babies and laundry. I didn’t understand it then, but my mother already knew what would happen when she passed onto the other side. She had been married to my father for twenty years, and knew all too well his temper. I knew it too, and had been on the wrong side of it more often than not. I tried to brush it off, to remind myself that he loved me, but it had gotten harder to do so since mother took ill. He’d been rougher than usual. I’d done my best to hide the bruise on my arm where he’d gripped it a bit too hard. It wouldn’t do to upset mother on her deathbed. I didn’t want to admit that it was her deathbed, but there was no denying it anymore. She was dying and there was nothing I could do. No wizard to call. No demon to summon. My mother was going to slip into the next world, and it would be soon. What would I do afterward? “I’ll remember, mother,” I said, and leaned down to kiss her on the forehead. Her skin was warm beneath my lips, and smelled of sour elderberries. It was the smell of wine, and sleep, something she’d been imbibing in far more lately. I couldn’t even try to be upset with her, I could see how much pain each movement was causing. The wasting disease had come on two summers before, slowly creeping inside her. First she couldn’t stand for very long, and took to working the farm from a chair that I carted around for her. Then she couldn’t stay awake for long periods of time and started taking naps throughout the day. At the beginning of the spring when others were out sowing the seeds for the next harvest my mother couldn’t rise from her bed. Her muscles had atrophied, leaving behind a husk of the woman I’d known. The strong jaw, and quick smile had been replaced by a skull covered in thin parchment. The sicker mother became the angry father seemed. “The garden just hasn’t been the same without you,” I said. It sounded hollow, even to me, but I had to say something. Didn’t I? Tired platitudes about getting well seemed out of place. There was no getting well, not anymore, and we both knew it. The finality in her words sent a shiver down my spine. But there was a smaller part of me that was glad. Mother had been in pain for so long, I just wanted her pain to end. If that meant letting her go then I would do it. No matter how much it hurt. I kissed her forehead again, and let go of her hand. The way I said goodnight, it sounded like the end of a long journey to me. Perhaps mother heard it because she sighed and gave me a wan smile before shaking her head. I couldn’t blame her. The way father had been acting it wouldn’t be a good way for her to go into the long sleep. I think she held on as long as she did because of him, but now the wasting disease was too much. She was ready. I smiled back, and patted her hand. Then I slowly stood, and turned my back on her, walking away. It was the hardest thing I’d ever done. It felt like I was giving her permission to die. After all the years she had held on for me and my father, it felt like the right thing to do. She was hurting, and staying would do nothing for her but cause her more pain. I could handle myself, and father if need be. But at that moment we didn’t matter any longer, I could only think of her failing strength, and the relief that seemed to emanate from her at that moment. I left, knowing it would be the last time I would see my mother alive. And I didn’t look back. I’ve been working on the new cover for the first book in “The Half Blood Sorceress” series. Book one, Dragon’s Flame, is finished. Well, the first draft is. I have a few things to clean up before sending it off to the editor, but I am hoping to have it out soon (in relitive terms). A tragedy. A secret. A journey to find the truth. Sybel watched as her mother burned on a funeral pyre, but she never expected her father to push her into the flames. When Sybel survives the pyre without a single burn she’s banished from the village for reasons she doesn’t understand. With more questions than answers, Sybil’s only hope is to make a treacherous journey to find the wise mages of Kemoor. As she ventures out beyond the edges of her village she finds a world filled with dangers; massive creatures, vindictive humans, and an ice cold wind blowing from the north. A wind that is far more sinister than anyone suspects. And the best part is I’ve already written most of book two. I’m hoping to have books one and two out this year, with the third one next year some time. I have at least a five book arc for this series. The Half Blood Sorceress is not part of the same world as my Witch’s Trilogy. In the Witch’s Trilogy there are many sentient creatures created by the elements. In The Half Blood Sorceress series there are three races; humans, dragons, and ifrits. The world building of these two series was so completely different. Peyllen (the world of Witch’s Trilogy) took years to flesh out. But because of all that world building the mythos of Peyllen is an entire series of it’s own that I’m still writing. The Half Blood Sorceress is different in a lot of ways, and so is the experience of creating the world, and writing the stories. I honestly can’t wait to get it out and hear what others have to say about it.